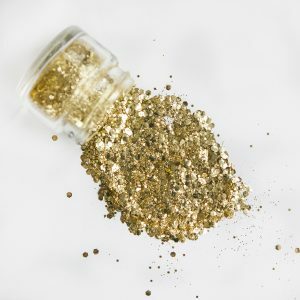 Unless you’ve been hiding under a (glittery) rock for a while, you may have noticed that more and more people are chatting about glitter. Some people are talking about how bad plastic glitter is (it’s very bad FYI) and some – like us- are shouting from the rooftops about how good glitter CAN be. We’re talking the biodegradable stuff! As with everything though, the term Biodegradable can sometimes hide a multitude of sins. 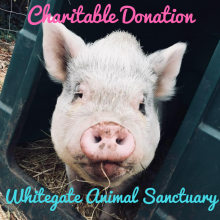 But not with us – and we’d like to prove it to you! First off, why is plastic glitter so bad?! I mean, I spent most of the 90’s covered in it, and I turned out fine (apparently). The problem lies not so much with the glitter whilst it’s being used, but afterwards. Normal glitter is a microplastic, and as such it will stick around on our lovely earth long after we’re gone. It is too small to be caught by water filtration systems, and so ends up in our oceans being eaten by all the beautiful creatures who live there. Ultimately, it’s bad news. This is why so far this year, over 60 festivals have BANNED it. 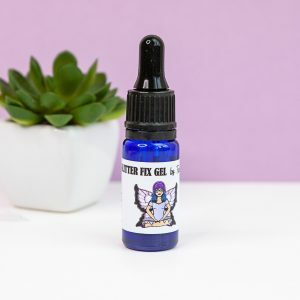 Which means it’s pretty serious stuff – after all, we’ve all seen sun soaked, glitter smothered photos from festivals and wished we were there too – but it seems regular glitter has lost its sparkle for many. Which is where we come in. We’ve been proudly flying the flag for Biodegradable glitter for some time, but there is still a lot of confusion. Biodegradable is a word that can be used by many, without needing to be proven. 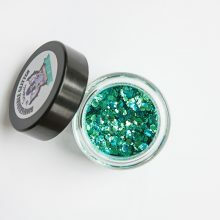 So you could end up buying biodegradable glitter, that’s really no better than the plastic kind you had before. 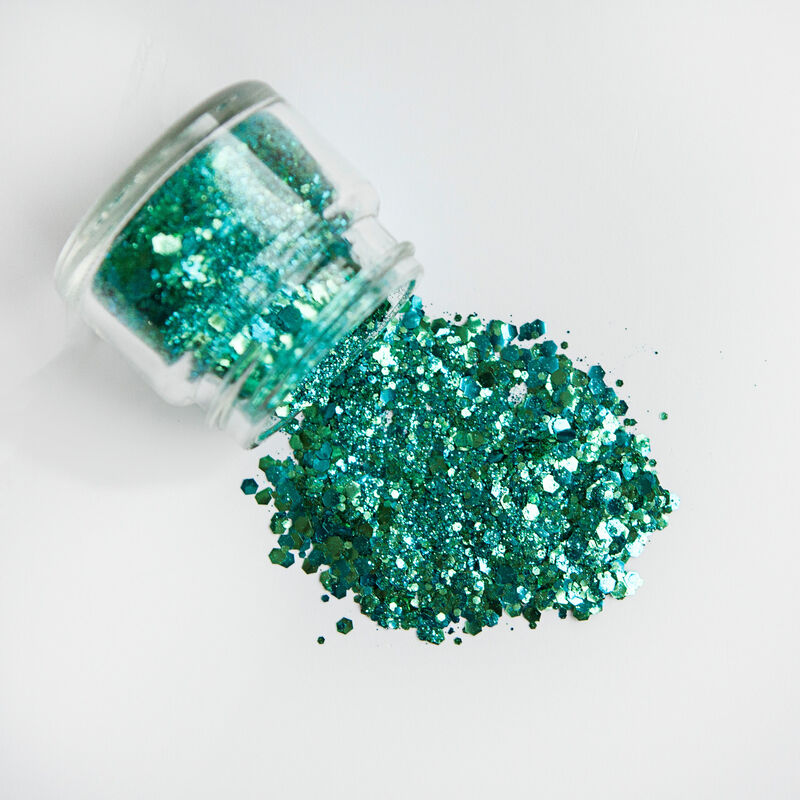 We work with the only company in the UK to have created fully biodegradable glitter – Bio Glitter is totes guilt free, and FULL-ON sparkle. It’s 100% plastic free, and certified as biodegradable in our countryside and freshwater. It’s made from a form of plant cellulose, and as such degrades like a leaf would, leaving no trace. It’s also absolutely GORGEOUS, and no different looks-wise to traditional plastic based glitters. 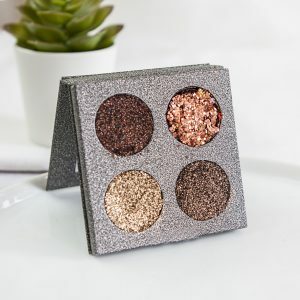 We currently sell our glitter in two forms – our fab pressed glitter palettes and loose pots full of sparkle. 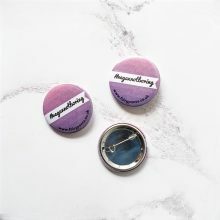 The palettes need no fixative or glue, and can be gently pressed wherever you want to shine! 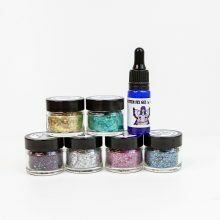 The loose glitter pots need to be used with our Glitter Fix Gel, and just need a thin smear to hold them in place all day long. The loose glitters can also be sprinkled over hairspray to make any ‘do look darling. 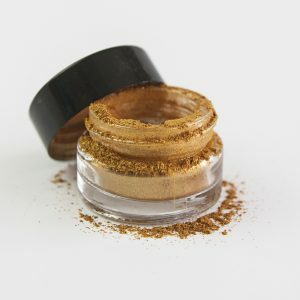 And lastly, we use teeny biodegradable glitter in our three glitter eye shadows – Bianca, Cordelia and Cleopatra <3, all three are pots of loose eye shadow, buildable and beautiful. These beauties are perfect if you’re after a more subtle shimmer! So in short, we’re telling you that you don’t need to give up your sparkle habit if you don’t want to – just make sure you switch to something kinder, and more sustainable. And tell everyone that your glitter is biodegradable! Hopefully we’ll still be seeing those glitter-smeared festival faces – but they’ll be vegan, cruelty free and biodegradable – just like us. This entry was tagged beauty, biodegradable glitter, cruelty-free, glitter, vegan, vegan glitter. Bookmark the permalink.